Indulge in fresh fruits and veggies that can keep your skin hydrated enough. The more you consume watery fruits and vitamin-rich vegetables, the more you become able to reduce face redness. Drinking lots of water is also necessary for combating the condition. Cool down the extract of an aloe vera leaf by placing it in the refrigerator. Massage the affected area of your face with it for 5 to 10 minutes at least 2 times a day. It soothes the skin effectively and drives redness away. Facial redness caused due to sunburns can be treated easily by coconut oil. Just rub it over the red area of your skin and wait for 15 minutes. The antioxidant properties of the oil will give you the best result very fast. 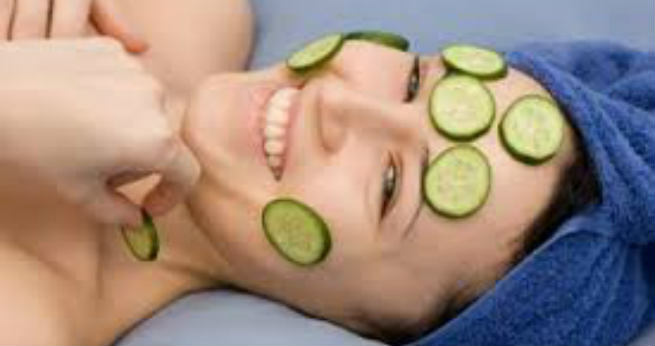 The nutrient content and soothing nature of cucumber makes it a wonderful home remedy for face redness. Peel and slice up a cucumber and put them over those red spots for minimum 15 minutes. Do it 2 to 3 times a day for the ultimate result. Mint is considered as an amazing herb with anti-inflammatory properties. Crush a few mint leaves to take the juice out of it and apply to your affected area with a cotton ball. It starts working in 5 minutes and reduces the itchiness significantly. It is another anti-inflammatory item that can cure face redness naturally. Just wash your face with lukewarm water and apply 1 tablespoon of honey to your problem area. After half an hour, wash off with lukewarm water again. Prepare chamomile tea by steeping 3 teabags into 3 cups of boiling water. After 10 minutes, discard the tea bags and cool down the concoction. Apply it on your red spots with the help of a clear washcloth. It can decrease reddishness and soothe the skin internally. As both cucumber and mint are good for face redness, you can prepare an effective skin tonic by grating as well as juicing up a cucumber and adding mint juice to it. Dip a cotton ball into it and apply to the red marks in upward strokes. Repeat several times a day. Make a mixture by adding a little milk to one tablespoon of honey and apply it to your problem area. The alpha hydroxy acid present in milk makes it a great cleanser, while honey plays a key role in improving the inflamed skin. Organic oatmeal is also considered as an anti-inflammatory element having considerable soothing effect. So, prepare a face mask by blending 2 tablespoons of milk with 1 tablespoon of oatmeal and apply it on your face once a week.